I usually have a bag of walnuts hiding out in the back of my pantry partially used from some long forgotten recipe. I recently came across a bag of walnuts, and decided to candy them. By adding a crispy sugar coat, the walnuts are elevated to something that you won’t find hiding in the back of my pantry because they are eaten almost immediately. I usually burn my tongue eating them hot because the smell and taste remind me of Nuts 4 Nuts – one of my favorite NYC street vendor treats. Candied walnuts can be used on everything from salads to chicken salad to desserts or just eaten as is. The process is pretty simple, but watch the sugar as it melts because it can burn quickly. Also make sure that you have a prepared sheet pan ready to go because they harden quickly. Preheat oven to 350 degrees. Line a baking sheet with parchment paper. [I spread the candied walnuts out on the same parchment paper, so make sure that you don’t throw it out when the walnuts are finished toasting]. Spread walnuts in a single layer over parchment paper. Bake for 5 minutes, or until toasted and warm. Watch these carefully because they can burn quickly. Once they are done, take them out the oven and set aside. Make sure that they are easily accessible. Place sugar in a medium thick bottomed sauce pan. Cook over medium heat, stirring with a wooden spoon. Keep stirring and cooking until the sugar melts and turns a medium amber. Sprinkle in salt and stir to combine. Quickly add the walnuts to the pan, and stir to coat the nuts with sugar. 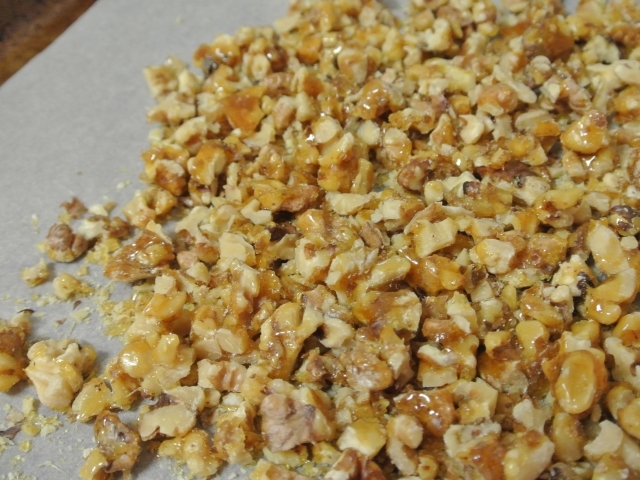 Dump the coated walnuts onto the parchment paper and spread them out as best you can. Let cool completely. Once cooled, use a large, sharp knife to rough chop the nuts. Store in an air tight container for up to a week. This entry was posted in how to and tagged candied walnuts, Sugar, Walnuts.